Attention to the health and nutrition needs of adolescents remains a challenge. 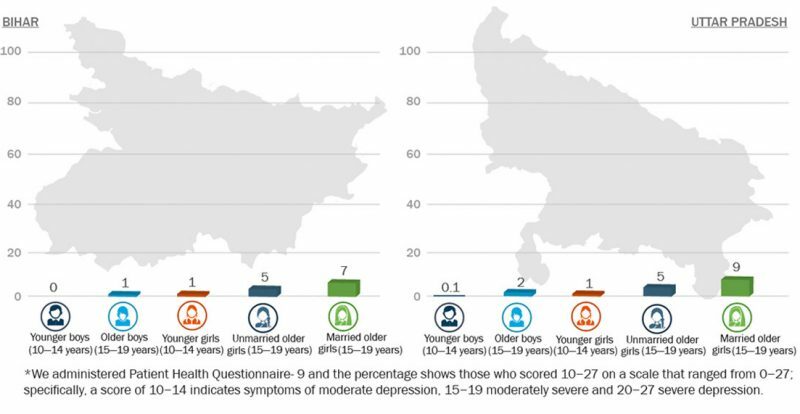 The UDAYA study collects evidence on nutrition, sexual and reproductive health, mental health, substance abuse, and risk factors for non-communicable diseases amongst adolescents in Bihar and Uttar Pradesh. The majority of older adolescents were aware of at least one modern method of contraception, with higher awareness amongst married girls. 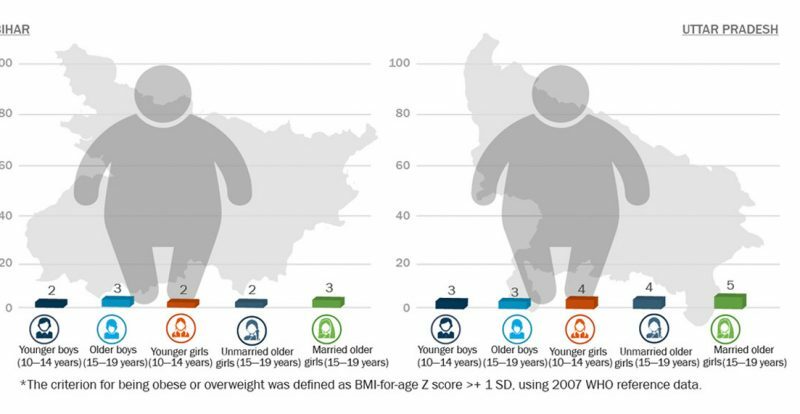 One in every four or five older adolescent boys in both Bihar and Uttar Pradesh was thin (lower BMI for age, as per WHO standards) compared to almost one in 10 older adolescent girls in the two states. 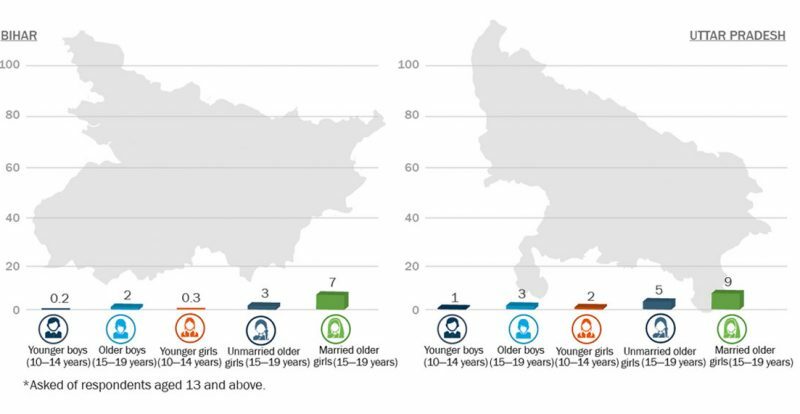 Thinness was higher amongst younger adolescents (17–30 percent), compared to older adolescents (7–23 percent) in both Bihar and Uttar Pradesh. Anaemia was more widespread—as well as more severe—among married adolescent girls than their unmarried peers. Contraceptive knowledge was gendered. Boys aged 15–19 knew more about condoms whereas unmarried and married girls knew more about oral contraceptive pills. Married girls’ access to antenatal care (ANC) was near universal, but around one in 50 adolescent mothers received full ANC services. Close to one in 10 married adolescent girls displayed depressive symptoms and contemplated suicide. Girls, in comparison to boys, and married adolescent girls, in comparison to their unmarried peers, displayed more depressive symptoms and contemplated suicide. 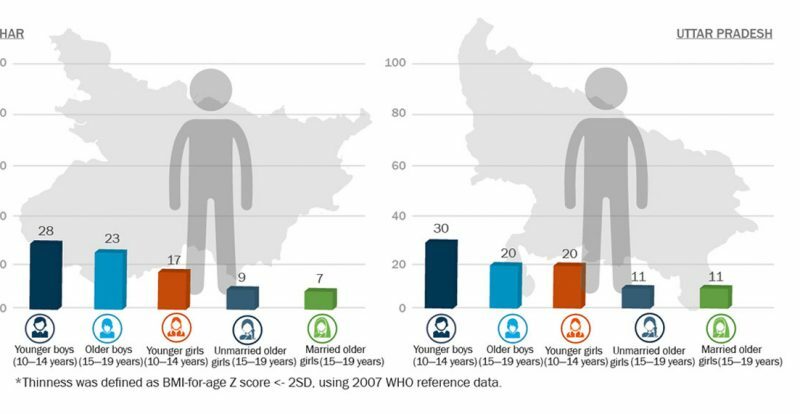 Nutritional status in Uttar Pradesh and Bihar indicated that a considerable proportion of adolescents were thin, with some differences between age groups and rural and urban areas. 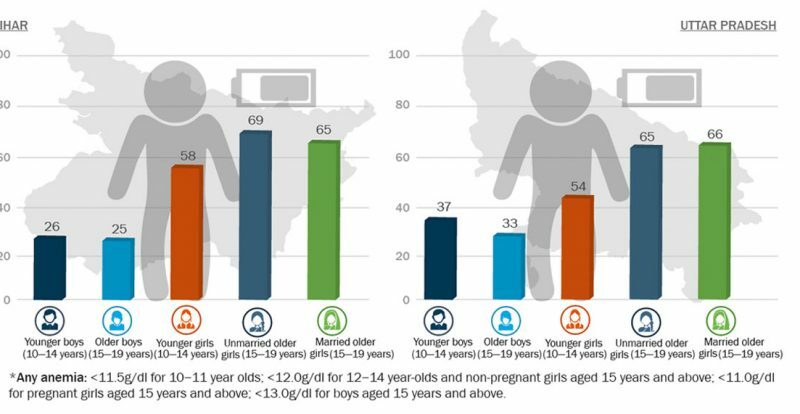 Anaemia was common: one-quarter of boys in Bihar and a little over one-third in Uttar Pradesh, and more than one-half of younger girls and two-thirds of older girls in both the states, had some form of anaemia. Moderate or severe anaemia was found in 15–30 percent of unmarried and married older girls in the two states. 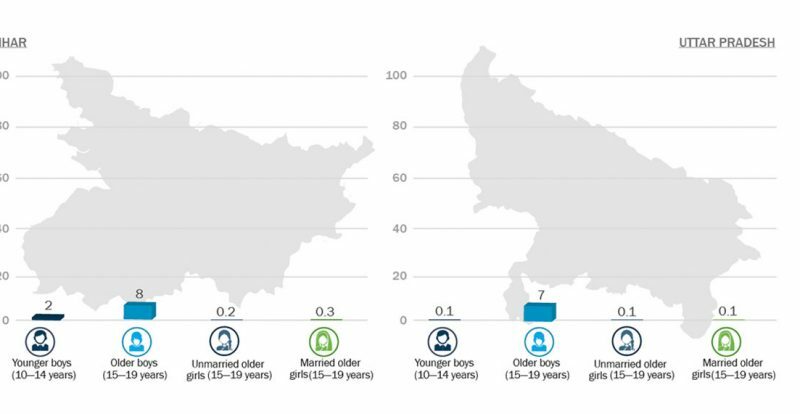 Anaemia was more common in Uttar Pradesh compared to Bihar, and it was the highest amongst married adolescent girls. Unmarried boys had better knowledge of condoms compared to unmarried girls in both Bihar and Uttar Pradesh. 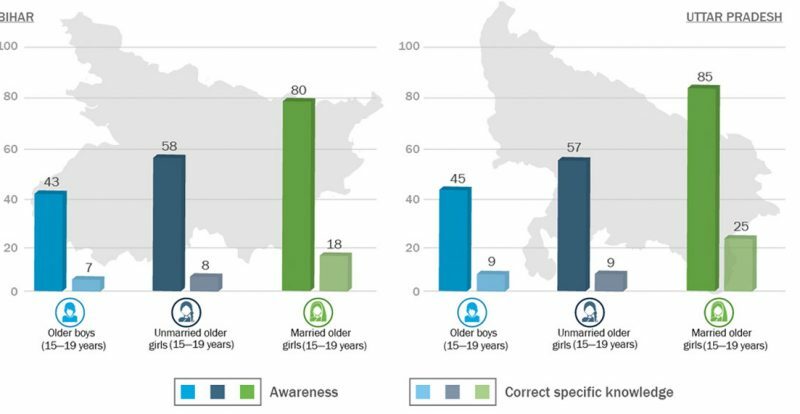 A large majority, 80–85 percent married girls in Bihar and Uttar Pradesh, were aware of oral contraceptive pills—which is higher than awareness among unmarried girls (57–58 percent) and boys (43–45 percent). Knowledge of emergency contraceptives was poor amongst older adolescents. Only one in eight to 10 older, unmarried adolescent girls had heard of emergency contraceptive pills. 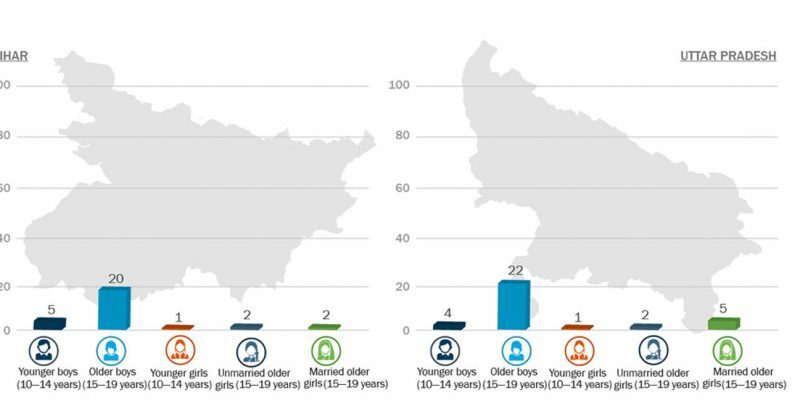 One-fourth of adolescent boys and married girls in Uttar Pradesh and one-fifth of older boys and one-eighth of married girls in Bihar were aware of emergency contraceptives. Access to antenatal care (ANC) was near universal in both the states: 95–98 percent of married adolescent girls who had at least one live birth reported receiving at least one antenatal check-up, and almost one-half received ANC in the first trimester of their pregnancy. 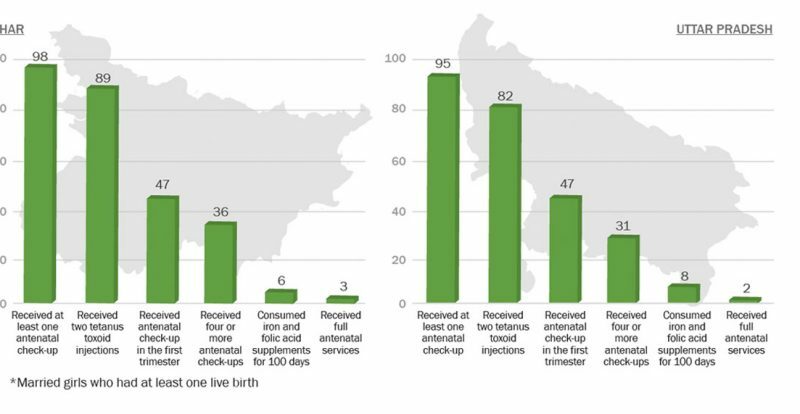 Although every four of five or more married adolescent girls with at least one live birth had the delivery attended by a healthcare professional, only one-third of them received the recommended postpartum check-up within two days of delivery. Girls are more vulnerable to depression. Boys are more vulnerable to substance use. While 0–2 percent of boys and younger girls (10–14 years old) displayed symptoms of moderate to severe depression, 5–9 percent of older girls reported symptoms of moderate to severe depressive disorders. Depression was the highest amongst married adolescent girls. A substantial proportion of older boys (20–22 percent) and a small minority of younger adolescents and unmarried and married older girls (1–5 percent) reported tobacco consumption, whereas fewer adolescents reported alcohol consumption (7–8 percent of older boys and 0–2 percent of younger boys and younger and older girls). Differences by residence in rural or urban areas were negligible.